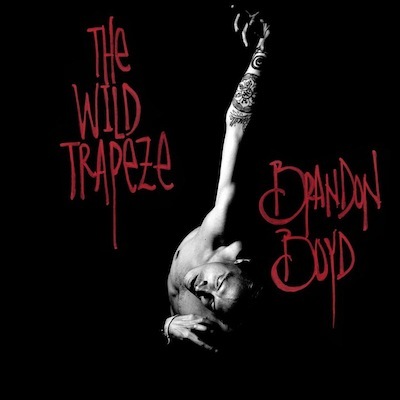 Brandon Boyd's first solo album, The Wild Trapeze, definitely will not disappoint all the girls who fell head over heels for him while he was drawing himself, shirtless, in the music video for "Drive." However, for any Incubus fan looking for more than Brandon's creative lyrics, this probably isn't the album for you. Almost every track sounds somewhat raw, and by raw, I mean distorted. After turning down every knob I could find on my car stereo to fix the distortion, I resorted to listening to the album with just headphones, then realized, damn it's meant to sound like that. Apparently he plays most instruments on the album which definitely fits the description of a true solo debut but the range of vocals without the pairing of the rhythmic flows of the Incubus that we all know and love, is kinda just, well, average. I recommend listening to the album as background music, rather than blasting it in your car with the windows down. Must Hear: "A Night Without Cars" & "The Wild Trapeze"
Instead of launching or redesigning an entirely new site for the artist's first solo album, Mr. Boyd decided to occupy a sub-section of his pre-existing websites, EnjoyIncubus.com and BrandonBoydBooks.com to create a microsite / exclusive store, TheWildTrapeze.com. The microsite is a neat place for fans to purchase exclusive Brandon Boyd content. For $9.99 you get the album and a letter from Brandon, for the same price you would pay for the album alone on iTunes. For $24.99 you get the CD, letter and special edition T-shirt. EnjoyIncubus.com is still decked out in "Monuments and Melodies" artwork from 2009, while I'm convinced BrandonBoydBooks.com hasn't changed since I purchased his first book in 2005 (with the exception of the flash player and admats on the home page). 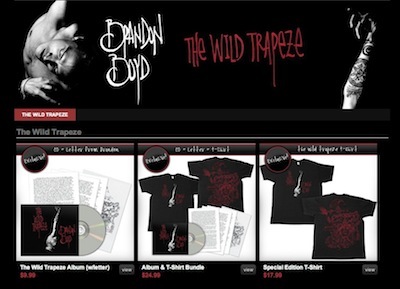 However the marketing for The Wild Trapeze on these sites is limited to a few album admats as well as a few news posts about Brandon's solo album and interviews surrounding the recent release. 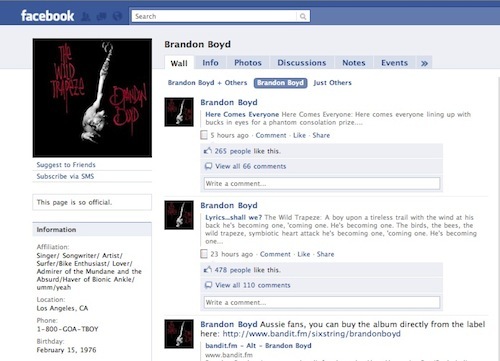 Apparently the band refuses to use Twitter, but Brandon Boyd has succumbed to the treacherous pull of Facebook and has just launched his own Facebook page, Facebook.com/BrandonBoydOfficial. The page is simple and direct, which gives the impression that Brandon Boyd could be operating the page on his own or he pays someone who is really quite good at reputation management. Highlights include an album of random photos / internet findings, that only someone as strange as Brandon Boyd would appreciate. Three notes written by the artist and a popular fan discussion board. The Incubus MySpace page is designed to compliment EnjoyIncubus.com, so there is not much hype surrounding Brandon's new album here. There is a Brandon Boyd Last.FM station and the video for "Runaway Train" has been released on Vevo.com/artist/Brandon-Boyd (See Below). Aside from these specific social profiles it is hard to decipher what is actually Brandon Boyd official or fan generated.